RIDE SHARE AND PUBLIC TRANSPORTATION IS HIGHLY ENCOURAGED! Take the Red, Brown, or Purple Line to the Fullerton stop, walk east on Fullerton to Orchard, walk north on Orchard two blocks. Take the Brown or Purple Line to the Diversey stop; walk east on Diversey to Orchard, walk south on Orchard four blocks. DRIVING - Saint Clement Parish has a small parking lot located on the south side of Deming, across from the church. Those visiting the church are welcome to park in this lot but since it's small spaces are limited. Please note, on Sundays (and eventful days), double-parking occurs in our lot. Street parking and other pay parking options are available throughout the neighborhood. Be sure to read posted street signage. PLEASE ALLOW 15 MINUTES IN YOUR TRAVEL TIME TO FIND PARKING. 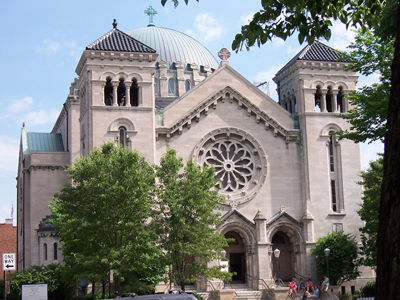 THERE IS NON-PERMIT STREET PARKING AVAILABLE ON STREETS SURROUNDING THE CHURCH. AND PLEASE ALLOW 15 MINUTES IN YOUR TRAVEL TIME TO FIND PARKING.